We arrived in Ipswich on Friday evening and after dinner, settled down for a good night’s sleep. We got up early the next morning, had breakfast and then headed out of Fox’s Marina down the River Orwell under motor since there was very little wind. By the time we reached the Port of Felixstowe, the wind had picked up, so we hoisted the sails and headed out past Harwich along the deep water channel. A few tacks later, we were out at sea and just before Landguard we bore away and headed to Walton Backwaters. We followed the buoys in and after a short slalom as we navigated past the buoys around Stone Point, we arrived in Walton channel where we picked up a mooring buoy. There we had a lunch of warm soup and bread rolls. By the time we had finished lunch, the sky had cleared. We left the buoy and headed back the way we came. 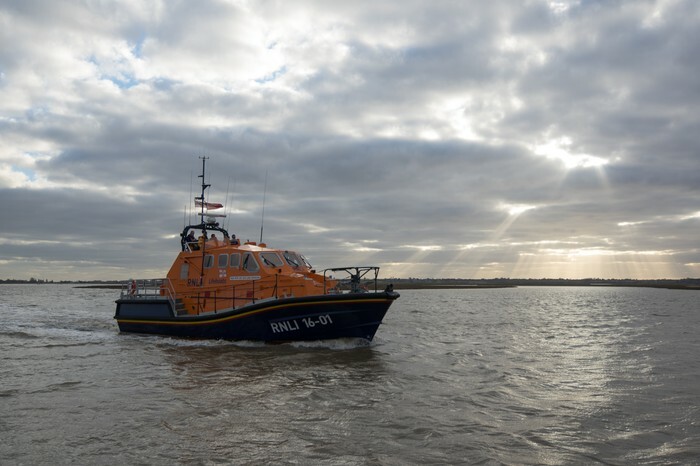 For the first bit we were followed by the local RNLI lifeboat until Stone Point. Once back past Harwich we radioed Shotley Marina and headed in through the lock to stay there for the night. We cooked an early dinner and went for a walk around the marina, which has excellent views of Felixstowe Port, a very impressive sight especially at night! Afterwards we walked into Shotley for a drink at the local pub. The next morning, we woke to a beautiful sunrise and clear blue skies. We had a wholesome breakfast of cereal, croissants, bacon and eggs and then headed out of the marina. With the tide and the wind behind us, we made quick progress up the River Stour. Not wanting to have too far to head back later we picked up a mooring buoy just off Wrabness. There we had a leisurely lunch. 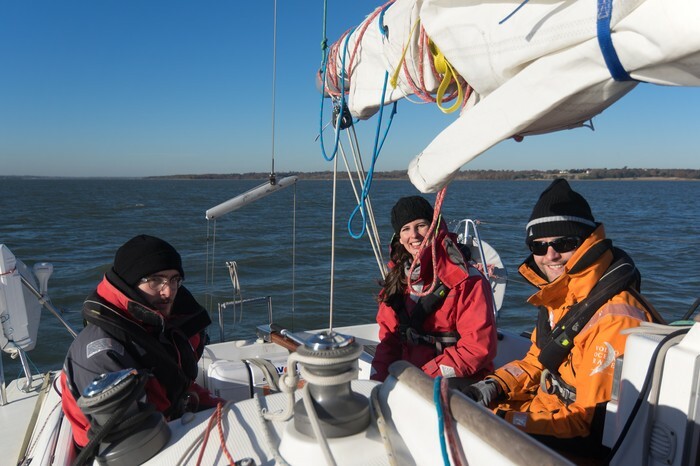 After lunch, the wind had picked up so we put a reef in the main and rolled the jib for the beat back to Shotley. For the first part out progress was a little slow since the tide was still against us. 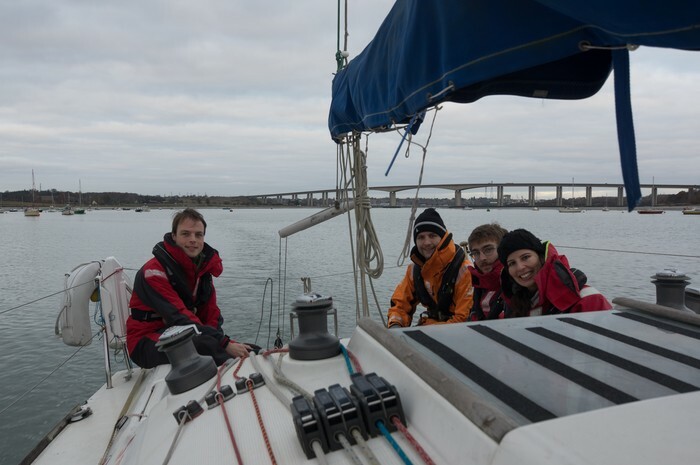 Once back at Shotley we headed up the River Orwell. Just outside Suffolk Yacht Harbour we dropped the sails and also made a brief stop to pick up a sail. By the time we came back out again, the sun had set and so we switched on the lights for the reminder of the journey back up to Fox’s, returning by around 6pm. Overall we had a lovely trip. The weather could not have been better, considering that it was December! We had steady winds of F4/5 and although the sky was clear it was not particularly cold. Everyone on the trip was able to take an active role in the sailing of the boat and had an enjoyable time.